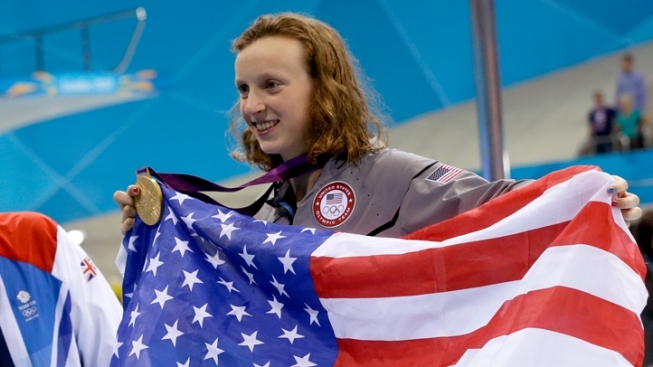 Katie Ledecky on the medal stand after winning Olympic gold in the 800m freestyle. Bethesda teen swimming sensation Katie Ledecky blew away the field Friday to win gold in the women's 800m freestyle final in a time of 8:14.63. Ledecky is the youngest woman ever to win the Olympic event at age 15 and just missed breaking the world record time of 8:14.10. Her final time was the second-fastest ever in history. Ledecky qualified second fastest with a time of 8:23.84 behind home town hope Rebecca Adlington of Great Britain, but left Adlington in her wake in the finals. Ledecky narrowly missed the world record that Adlington set in the 2008 Beijing Games. She was ahead or on pace for most of the race, but fell off on the last lap. Mireia Belmonte Garcia of Spain took silver with a time of 8:18.76 and Adlington got bronze with a time of 8:20.32. Ledecky's win gave the U.S. swimming team back-to-back-to-back golds during a stunning streak Friday, with Missy Franklin setting a new world record and Michael Phelps taking home his 21st medal. Franklin won the gold in the 200m backstroke with a world-record pace and became the first American woman in 40 years to win gold in the event, her signature race. Phelps followed up by taking gold in the 100m butterfly for another record -- his 21st career medal. He becomes the second Olympic athlete in history to win two individual events at three consecutive Olympics.